Ever since North Korea directly connected to the Internet in 2010, there’s been a lot of interest in how the world’s most closed country maintains and uses the link. It connects a handful of Web sites in Pyongyang serving propaganda to the world and allows foreigners in the country largely unfiltered access to the Internet. It also provides monitored access to an unknown number of senior officials, scientists, and university students. Yet for everything we’ve learned, there’s still a lot we don’t know and now there’s a new mystery: Last week, the country’s sole Internet link with the rest of the world went down for about three hours. It was the longest outage of the year and meant the entire country was disconnected from the Internet, according to monitoring by Dyn Research. Such outages have happened before, but what happened next was new: Over the next four nights at almost exactly the same time, the connection went down again for about five minutes. The three-hour outage began at 11:40 p.m. local time last Wednesday, and the shorter outages occurred on Thursday, Friday, Saturday and Sunday nights. Each began a few seconds after 11:45 p.m.
A series of outages affecting North Korea’s connection with the rest of the Internet can be seen in this graphic from Dyn Research. The reason for the outages is unclear, but they haven’t occurred on Monday, Tuesday, or Wednesday this week. “Based on the timings I would guess that a human was doing something at [11:45pm] that included rebooting their router,” said Doug Madory, director of Internet analysis at Dyn Research, when asked for his best guess on what might be happening. 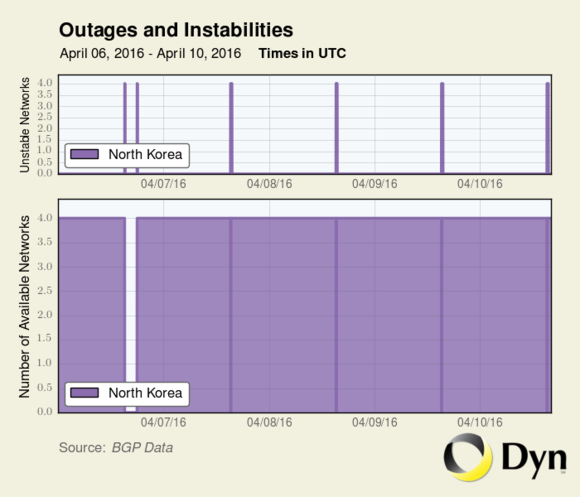 So for now, the outages remain another little mystery in the story of how North Korea connects and manages its Internet link. Whatever the reason, the impact is a little easier to guess. 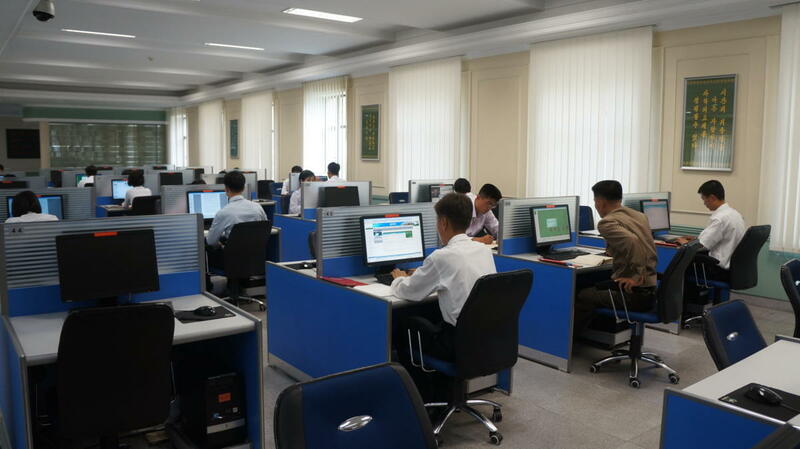 It’s impossible for most North Koreans to get access to the Internet, and any that do would connect through terminals in government buildings or companies. There, access is continuously monitored to ensure they don’t stray to sites they aren’t supposed to see—a group that would include any sites carrying news or information. Until recently, foreigners in the country were allowed relatively free Internet access, but rules recently changed. About a week before the string of outages, North Korea signaled that it had begun blocking access to Twitter, Facebook, YouTube and South Korean news websites for all users.